St. Francis of Assisi Catholic School seeks to prepare our children in mind and spirit during the most formative and vulnerable time of their lives so that they can live lives full of hope, joy and peace, no matter what challenges they meet. Each day presents opportunities for students to learn, care and lead in the classroom, at lunch and during recess. You are invited to attend a school Mass. Come and celebrate a joyful liturgy with the students. See the School Mass Schedule. St. Francis is a Catholic school with a philosophy of fostering a true Christian atmosphere for the education of children. By working together, the whole community is striving toward the common goal of a better school. Students participate in schoolwide projects and individual class projects. Each year, the Religion committee meets to determine a theme and plan to approach service for the current school year. Classroom teachers work together to develop a service plan for the school year. Information of the wonderful service projects is shared monthly in the Forum, principal’s letter and in classroom newsletters. 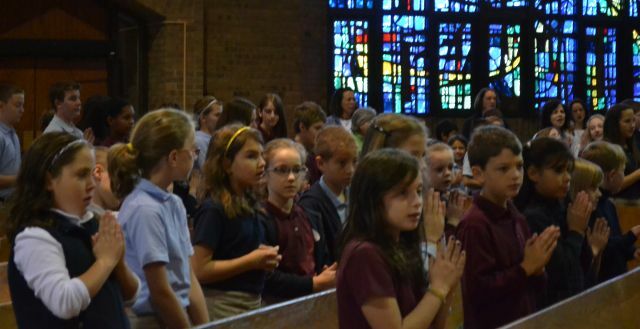 All grades spend quiet prayer time at Eucharistic Adoration every Thursday in the church during the school year. Please join us any time!